The bear can be seen wandering through the parking lot at Crazy Bruce's Discount Liquor on Farmington Avenue in Bristol before making its way to the sidewalk and walking through the store doors. 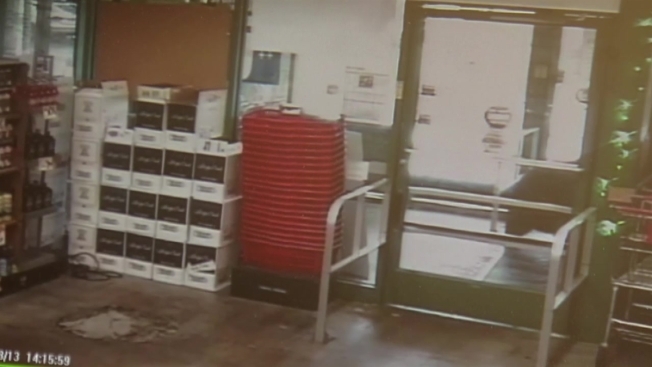 A bear wandered into a Bristol, Connecticut liquor store Monday and the entire incident was captured on surveillance camera. The bear can be seen wandering through the parking lot at Crazy Bruce's Discount Liquor on Farmington Avenue before making its way to the sidewalk. An employee said the automatic door, operated by motion sensors, opened for the bear, which walked into the vestibule. The animal only made it to the doorway. Two quick-thinking employees hooked the latches at the top of the second set of doors from inside the store to prevent the bear from making it all the way in. An unsuspecting customer actually walked right through the vestibule without noticing the bear as he was ushered inside by an employee. One of the employees, Daniel Thibodeau, told NBC Connecticut he acted quickly in a situation where there is no standard procedure. “Instinct I guess, that’s what I’m thinking,” Thibodeau said. The bear ran off and no one was hurt. The Department of Energy and Environmental Protection was notified.